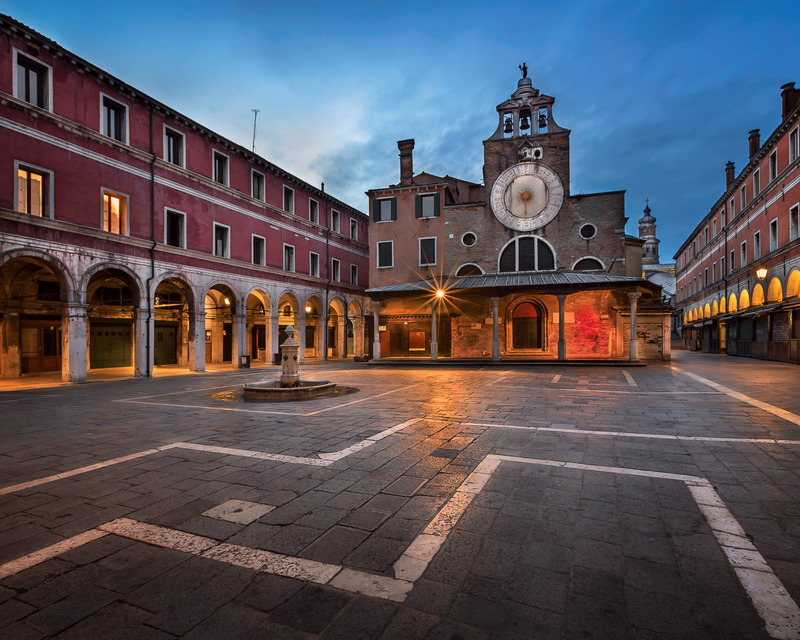 Mornings before dawn in Venice are hauntingly quiet. As you walk among the city you can almost hear the ghosts of the past. March 2014, single image, additional exposures for highlights, focal length 16mm, aperture f/11, shutter speed 2.7 seconds, ISO 100, tripod. As I wondered in front of the San Giacomo di Rialto Church I felt enraptured by the view of this church. The San Giacomo is the oldest church in Venice dating at least as far back as 421 AD when it was consecrated. One can only imagine the funerals, weddings and services that have taken place in this church well over one thousand years. If you believe in ghosts one could say this place is without a doubt filled with spirits from the past. It was more than a feeling that made me desire to use the San Giacomo di Rialto Church as main subject in this composition. The way the city seemed to naturally frame the church looked as if the architects of the city built this particular spot just for taking wonderful photos. The fountain on the square and multiple white lines on the floor made for perfect composition. I placed the fountain in mid-ground and the white lines fell nicely in the foreground to encompass the fountain. As a result, the eye investigates the foreground then naturally led to the fountain then next to the church. Spending blue hour to make this photo I lingered long enough to capture what I needed. Next I hurried off to the Rialto Bridge to capture the it during golden hour. When you are a photographer lighting is what plans your days during your travel.